If you’re still taking the “spray and pray” approach to your lead generation efforts, stop. MRED now offers something way better. Let’s face it: Mass marketing, shotgun marketing — whatever title you give it, you can’t call it a reliable strategy. Even if you’re lucky enough to score a usable lead from a 3,000-postcard campaign or a day of door knocking, they still aren’t time- or cost-effective methods. That’s why hyperlocal targeting has become the standard in real estate marketing. That’s why focusing your limited resources on pursuing better leads is the only way to survive in an increasingly competitive market. That’s why it’s the perfect time for Remine. MRED is thrilled to launch this predictive analytics tool, a product that sorts through billions of data points and uses that information to highlight consumers who are likely to buy and sell. That means you’ll be spending less time chasing leads and more time closing them. And now you have this unprecedented opportunity at your fingertips in connectMLS. MRED is providing its subscribers with access to Remine’s starter plan, with upgrades available if you want to take your prospecting to the next level with additional tracking, filters, and discounts on purchasing contact information. Ownership time: The majority of homeowners move every 7-12 years. Visualize this data on Remine’s interactive map to see where future housing inventory and buyers might be coming from. Last sale price: See trends of how much homes have sold for in your target markets. Sell score: Remine uses property data to predict the amount of time remaining before a listing is put on the market. This information is broken down in categories ranging from 0-6 months to more than 2 years. Home equity: This filter is available in upgraded plans and allows you to see consumers who have enough equity in their home to put their property on the market. Use this filter to better target homes for door knocking, cold calling, and email campaigns. Consumer contact information: Once Remine helps you identify consumers who will need your services, you have the option to purchase household contact information a la carte. So are you ready to pursue real leads? Are you ready to find opportunities that can actually turn into revenue? Are you ready to Remine? You can start here in connectMLS and click on Remine in the tools section. Want some more tips before you get going? Take advantage of the training options below. Register for live Remine webinars below. These one-hour sessions will give you a walkthrough of the property intelligence platform as you learn how to best utilize its many tools. Click here and select “Remine” or “Remine Online” under “Course” to register for MRED training. For any additional help, you can chat with Remine’s support team by clicking the blue and white button on the bottom right of the screen when using Remine. And you can always contact MRED’s help desk by calling 630-955-2755 or sending us an email. LISLE, Ill. – March 7, 2018 – The award-winning Midwest Real Estate Data (MRED) Support Center added another distinction to its long list of achievements by being named one of the Top Contact Centers in North America for 2018. MRED received the honor for the ninth straight year from BenchmarkPortal in the organization’s small-sized center category. BenchmarkPortal deemed MRED worthy of the award based on objective, metrics-driven performance data such as caller satisfaction, average hold time, and average talk time. MRED was also awarded in the individual category of Best Agent Retention. BenchmarkPortal has annually conducted statistical analyses of call center operations throughout the world since 1995. The company hosts the world’s largest call center metrics database in conjunction with the Center for Customer Driven Quality located at Purdue Research Park, Purdue University. Midwest Real Estate Data (MRED) is the real estate data aggregator and distributor providing the Chicagoland multiple listing service (MLS) to more than 40,000 brokers and appraisers and over 7,300 offices. MRED serves Chicago and the surrounding “collar” counties and provides property information encompassing northern Illinois, southern Wisconsin, and northwest Indiana. MRED delivers more than 20 products and services to its customers. MRED is the 2013 Inman News Most Innovative MLS/Real Estate Trade Association, and for nine consecutive years the MRED Help Desk has been identified as one of the best small business centers in North America by BenchmarkPortal. For more information please visit MREDLLC.com. Founded in 1995, BenchmarkPortal is a global leader in the contact center industry, providing benchmarking, certification, training, consulting, research and industry reports. The BenchmarkPortal team of professionals has gained international recognition for its innovative approach to best practices for the contact center industry. BenchmarkPortal hosts the world’s largest database of contact center metrics, which is constantly being refreshed with new data. BenchmarkPortal’s mission is to provide contact center managers with the tools and information that will help them optimize their efficiency and effectiveness in their customer communications. For more information on BenchmarkPortal please call 1-800-214-8929 or visit www.BenchmarkPortal.com. 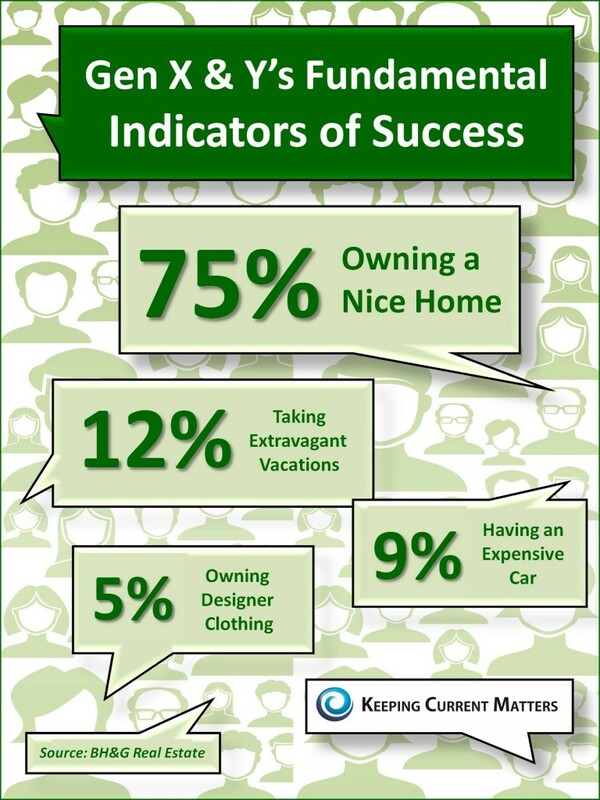 Check out this infographic showing what Gen X & Y believe to be indicators of success from KCM Blog. NAR is collecting donations to assist those affected by Hurricane Sandy. Click HERE to make a donation. 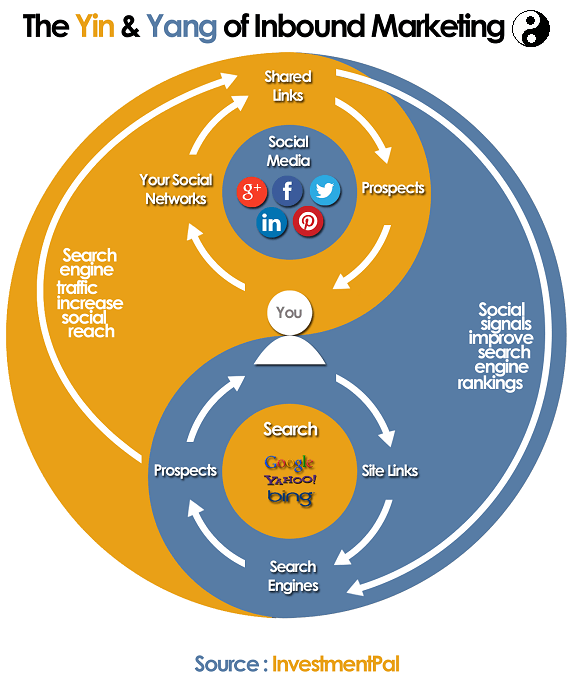 Are you leveraging both social media and search in your inbound marketing efforts? Read about the correlation between Social Media and search in this post HERE. This infographic provided by InvestmentPal Blog. LISLE, IL–(Marketwire – Oct 30, 2012) – Midwest Real Estate Data (MRED), Chicagoland’s multiple listing service (MLS), has announced that its Chief Executive Officer Russ Bergeron has been elected to the 2013 Board of Directors of the Real Estate Standards Organization (RESO). RESO is a group of real estate organizations working together to develop and implement data standards and processes that support innovation, ensure portability, eliminate redundancies and obtain maximum efficiencies for all parties participating in the real estate transaction. RESO’s ultimate goal is a fully automated real estate transaction facilitated by data standards and processes accepted by real estate professionals everywhere. The Real Estate Transaction Standard (RETS) is a common language spoken by systems handling real estate information, such as multiple listing services (MLSs). Most of RESO’s work currently involves RETS and data definitions to be utilized within RETS. Standardization of data fields and ease of portability of data are of the highest priority to MRED and other MLSs for efficiency of data delivery and the minimizing of expense related to these activities. Midwest Real Estate Data (MRED) is the real estate data aggregator and distributor providing the Chicagoland multiple listing service (MLS) to nearly 40,000 brokers, agents and appraisers and 8,000 offices. MRED serves Chicago and the surrounding “collar” counties and provides property information encompassing northern Illinois, southern Wisconsin and northwest Indiana. For more information, visit www.MREDLLC.com.